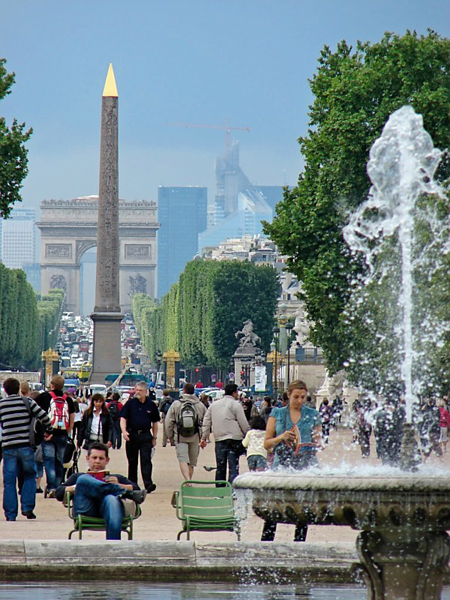 Travelers to the City of Light definitely should not miss a chance to visit one of Paris’s many parks during the summer when then weather is warm and sunny (yes, it can be sunny in Paris! ), the trees are lush and rustling in the breezes off the Seine, and Parisians show up in force for picnics, sunbathing and to just stroll through and relax in these urban oases. And there are dozens of Parisian green spots from which to choose, from tiny half-block squares to the massive Bois des Vincennes along the southeastern edge of the city that covers nearly 2,500 acres. 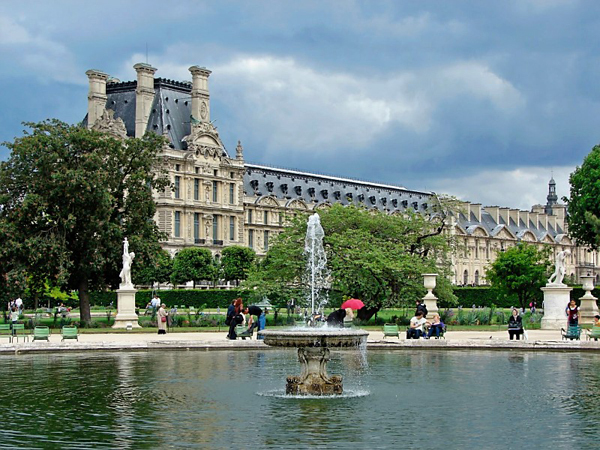 One of my favorites is right in the heart of “Visitor’s Paris” and is one of the City of Light’s larger parks, the Jardin des Tuilieries, which connects the Louvre with the Place de la Concorde in the city’s tourist-centric 1st Arrondissement. A one-time royal garden (created for Catherine de Medicis in 1564), the Jardin des Tuilieres covers about 63 acres. It has been the site of many historic events throughout Paris’s rich history, including serving as the private garden to Marie Antoinette and her son at the beginning of the French Revolution (the pair were initially held captive in the Tuileries Palace, now part of the Louvre, before being separated and sent to other prisons), as the encampment for occupying Russian and Austrian soldiers following the fall of Napoleon, and as the site of several deadly street battles during the liberation of Paris in World War II. It also was the site of the fencing competitions during the 1900 Olympics, which was notable for including female athletes for the first time in the history of the Games. The Tuileries was expanded and upgraded several times over the centuries, but today reflects the formal-garden style established in 1664 for King Louis XIV. While most of the statuary in the park hails from the 18th and 19th centuries, major projects launched in 1964-1965, 1998 and 2000 resulted in the installation of nearly two dozen contemporary works. 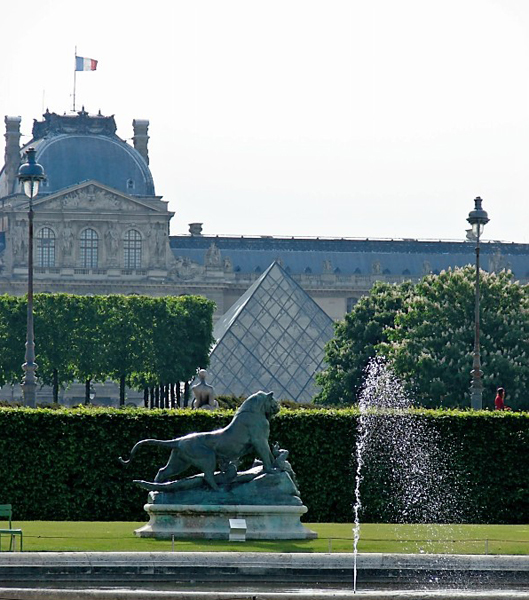 The garden is notable for its unobstructed vistas of the Louvre (when looking east) and the Place de la Concorde (when looking west); its two reflecting pools–the Bassin Octogonal and Grand Bassin Rond; and for serving as home base for the L’Orangerie and Jeu de Paume museums. 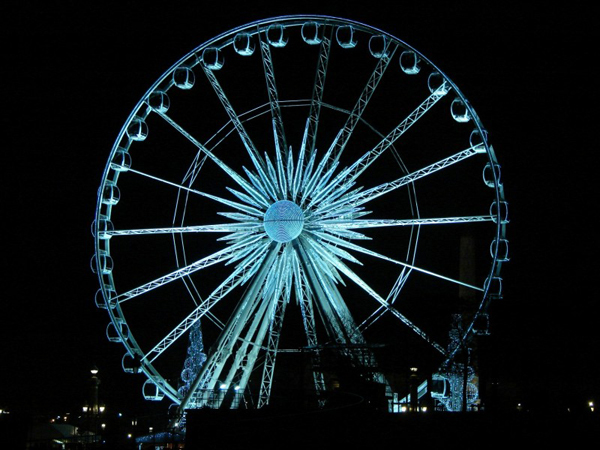 The western edge of the park also hosts the Grande Roue de Paris–a 60-meter-tall Ferris wheel that is erected annually for the Christmas and New Year’s seasons, while two small eateries–Cafe Renard and the pricey Restaurant Le Medicis Lecointre Paris–are located in the western third of the green space. 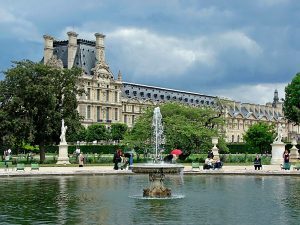 The Jardin des Tuileries is free and accessible from the city’s Concorde, Tuileries and Palais Royal-Musee du Louvre Metro stations. 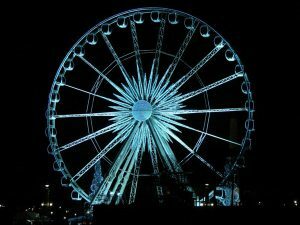 It is open daily during the summer from 7 a.m. to 11 p.m., in the spring and fall from 7 a.m. to 9 p.m. and in winder from 7:30 a.m. to 7:30 p.m. This entry was posted in Famous Paris destinations, French history, History of Paris, Parks and Squares, Summer in Paris and tagged 1st Arrondissement, Jardin des Tuileries, Jeu de Paume, L'Orangerie, Louvre, Place de la Concorde by Bob Adams. Bookmark the permalink.